Rajdeep: Amidst all the celebrityhood, when is Sania going to settle down? Is it going to be in Dubai? Is it going to be in any other country? What about motherhood… building a family… I don’t see all that in the book, it seems like you don’t want to retire just yet to settle down. Sania: You don’t think I’m settled? Sania: You sound disappointed that I’m not choosing motherhood over being number one in the world at this point of time. But I’ll answer your question anyway, that’s the question I face all the time as a woman, that all women have to face – the first is marriage and then it’s motherhood. Unfortunately that’s when we’re settled, and no matter how many Wimbledons we win or number ones in the world we become, we don’t become settled. But eventually it will happen, not right now. And when it does happen I’ll be the first one to tell everybody when I plan to do that. 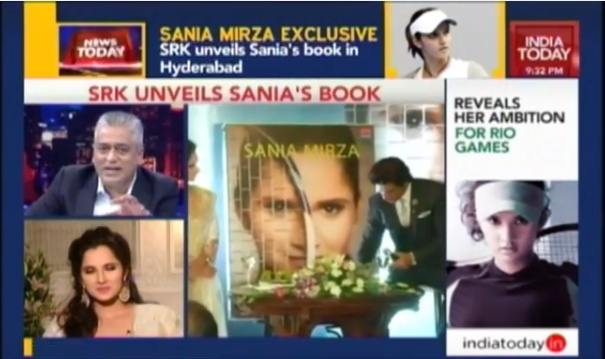 Sania: I’m so glad, you’re the first journalist to apologise to me on national television. Rajdeep soon understood the subtle jibe and apologized again!